Indichik: Margaret Atwood on Twitter? It's true. The interactive, worldwife tour for Margaret Atwood's new novel The Year of the Flood is to involve actors and music composed exclusively for the book, which needless say sounds supremely awesome. (I can't find a complete tour schedule as of this post, but rest assured I will stay on top of this). 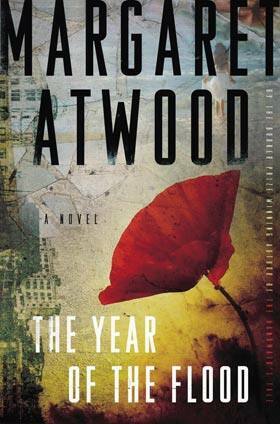 The book itself is a sequel, or rather companion book, to 2004's speculative novel Oryx and Crake). To be sure, I never thought I'd see the day when I'd be able to type @MargaretAtwood, and that her perpetual and regal genius would be as real as your average pr0nbot or marketing scammer, but it's a delightful prospect. Now would probably be a good time to note, for the benefit of full disclosure, that my love for Atwood's writing has been boundless ever since I read The Handmaid's Tale (voluntarily, not for class) my sophomore year of high school. You know that writer who you discover and immediately decide to read his or her entire oeuvre right then and there? Well, that's Atwood for me. Ultimately, The Blind Assassin came out at the top of the list. Neither I, nor my writing, was ever the same after that book. Please read it. Atwood's complete tour schedule for The Year of the Flood, featuring music composed by L.A.-based composer Orville Stoeber, can be found here. It's one hell of a trip, comprising the U.S., Canada and Europe, and kicks off August 23rd aboard none other than the Queen Mary 2. I loooooveeee itttt.. MAN she is awesome. I know, I'm totally seeing her when she comes to New York. Want to come?